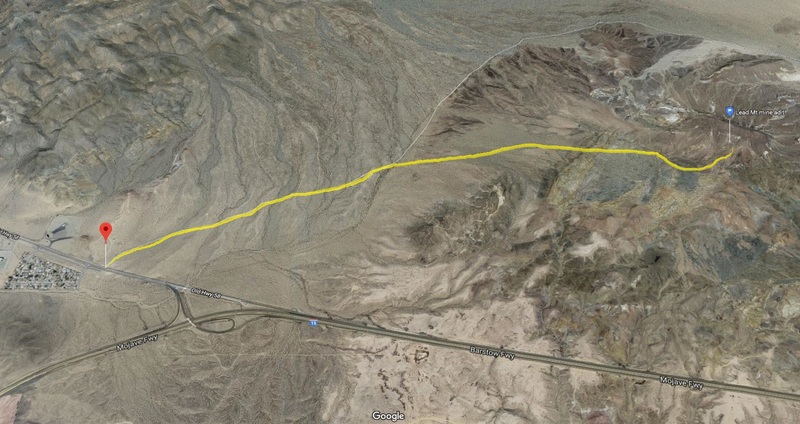 The group met at 9AM at the Meadow Grove Rd turnoff from Old Hwy 58 in Barstow. The day was very gloomy and the cold wind was not making it easier for us, but the collecting excitement prevailed. We had 5 cars total, including one guest interested in joining MSSC and one friend from the Southern California Friend of Mineralogy. The road to the mine was a little bit shaky but all vehicles made it with no problems. After parking the cars we went straight into the main adit, everybody brought their hard hats as required for safety. One member brought the portable short-wave UV light and we enjoyed really incredible colors on the main chamber walls, from white, yellow, orange to red and purple. The elusive green was not seen, but more about it later. Some people worked the main chamber walls, others looked around for more good material. Excellent clear and milky baryte was everywhere and everybody got some. Some of the baryte crystals up to 2 cm in size were distinctively zoned. Hemimorphite did not disappoint either. There was a lot of potential micro minerals on the material we collected. The finds shown below are based on further microscopic examination and identification with Raman spectrometer thanks to MSSC President, George Rossman for access to his IR mineralogy lab at Caltech Division of Geological and Planetary Sciences and Bob Housley who identified the specimens. One of the minerals we were looking for was supposed to have a strong green fluorescent response to SW UV light, but we did not see any. However, one of my samples exhibited a very strong white fluorescence, even as the area size was below 1 mm. The Raman spectrum of the bright dot matched the willemite spectrum in the library. This is the first report of this highly fluorescent zinc silicate ( Zn2SiO4 ) from Lead Mtn mine. It is more famous from its occurrence at Franklin mines in New Jersey. There was a 1 cm wide galena vein in one overhead area in the main chamber roof , the vein was surrounded by red and yellow material which was shared with all participants. The red powdery material was cinnabar and the sparkly yellow crystals were mimetite. Areas a few cm away from that vein had some tufts of dark silver-black needles of coronadite on baryte. It is a rare Pb-Mn oxide. Some coronadite needles were associated with excellent quality microscopic translucent red goethite crystals. This iron hydroxide is more commonly blamed for being a component of limonite and rust and being hard to remove from nice specimens, but not at Lead Mtn mine. Also found there was a very rare, dark red spinel-shaped crystals of rare Zn-Mn oxide, hetaerolite. The crystals are very small and require high magnification under the microscope. The wind was not getting any better and it felt like inside of the adit was warm and cozy compared to the dumps outside. Due to the wind and the looming rain forecast for the afternoon I decided not to pursue other areas close by like e.g. Lower Copper area or American Borax mine on the north side of Lead Mountain. It will have to wait for our future visit to the area, hopefully next year. Fortunately, everybody got a lot of great material and did not leave the parking lot empty handed.